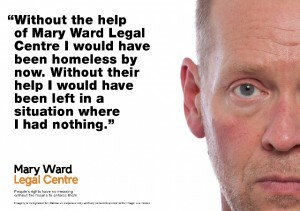 The Mary Ward Legal Centre is housed in our shared building at 10 Great Turnstile, London, WC1V 7JU. It helps people who live in London to access their legal rights and entitlements by providing free and independent advice. Its services focus on debt, employment, housing, welfare benefits and general legal advice. Unfortunately, it does not cover immigration, family law or criminal matters. Please try Find a legal adviser instead. The Legal Centre aims to help low income individuals and our areas of law are covered by different funders so we have different access criteria. You will therefore need to be assessed by our Front Desk Team to see if the issue you are contacting us about is one we can offer you’re an appointment for. If you are an employer or a landlord, the centre would not be able to advise you. It offers advice on all personal debt issues regardless of amount as long as your live study or work in greater London. We can help with rent and mortgage arrears, benefits overpayments, bankruptcy and unpaid gas/electricity bills. To access this service, you can drop-in or call directly to the Debt Line on 020 7269 0292 Monday to Friday between 10am -1pm and 2pm- 4pm. Please check our website for more details. Due to funding cuts, it no longer takes on employment cases. However, it may be able to offer you advice at the weekly evening session. To see if you are eligible for an appointment for advice at its evening session please call 0207831 7079 Monday to Friday between 10am and 1pm. We can provide advice and representation on a range of housing issues including homelessness, appealing decisions in the county court, defending possession proceedings and warrants for eviction on both private and public sector tenants. To be eligible for the service, you have to live in the Camden Borough and be eligible for legal help. Please use the Legal Aid Eligibility Calculator to check if you are qualified. If you are qualified, you can then book an appointment on 020 7831 7079 Monday to Friday between 10am -1pm or attend the first come first served drop-in session every Thursday between 10am-12pm. It provides specialist legal advice on welfare benefit, tax credit issues and problematic claims such as refusal of benefits, appeals, sanctions, disability benefits and ESA. However, it does not offer basic benefit checks or form filling for new claims. To be eligible for the service, you have to live in the Camden Borough. If you live, work or study in Camden, you can book an appointment on 020 7831 7079 Monday to Friday between 10am -1pm or attend the first come first served drop-in session every Mondays between 2pm-4pm. Alternatively, you can visit its website to check out the outreach services it offers. neither will it provide advocacy or representation. These sessions are by appointment only. Please call its Front Desk Team on 020 7831 7079 Monday to Friday between 10am and 1pm to have your case assessed and appointment booked. write to or visit 10 Great Turnstile, London, WC1V 7JU.